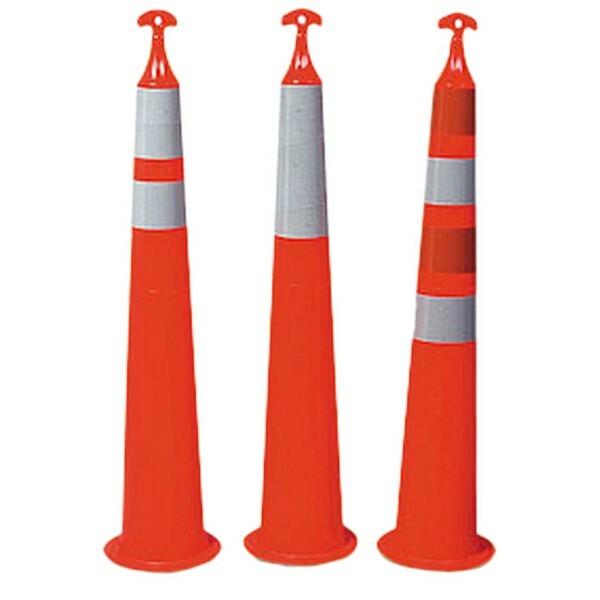 Grabber Cone, Channelizer Cone, Traffic Cone, and more from Trans Supply.com ! 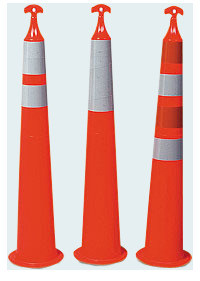 This unit has three different uses; tubular delineator post, sleeved cone, and channelizer. T Top handle has mounting hole for light and a longer handgrip area. Units can stack even with bases on. Base Size Octagon: 16 1/2" x 1 3/4"
Bands are reflective strips of tape to make the cone easier to be seen during the night. Reflectivity has different grades, the least reflective is Engineer Grade, the next reflective is Hi Intensity and the most reflective is Diamond Grade. Why is this called a Grabber Cone? T Top and Grabber basically is the same thing, just two different brand names. Both have a handle at the top made for easy grabbing. Fluorescent orange is our standard color, for other colors please call. Additional charges may apply. If quantity desired is large enough, lots of times my suppliers will make any color needed as long as they can get the plastic. Will these stand up without a base? They can just barely stand up on their own without a base. How heavy should my bases be? In an area with 20-30 mph winds the 15lb base will do, for 30 mph winds or more we suggest a 30lb base. You can also double up on bases if 30lbs is not enough. How soon can these ship out? This depends on how many orders my supplier has lined up at the moment. We can guarantee that the quicker you order them, the quicker they will ship. Always better to get in line ASAP. Shipping quotes are custom and change based on quantity ordered and location from warehouse, so we would need your zip code, quantity desired and weight of base to provide you with shipping details.